Replay Review plays in Game 3 of the Cubs-Giants NLDS concerning similar out vs pulled foot calls at first base—one helping Chicago and the other San Francisco—produced added scrutiny of Major League Baseball's Replay Review system. CF is clear but lacking. RF is helpful but...? The first such play occurred with none out and none on in the bottom of the 6th inning when Giants batter Conor Gillaspie hit a ground ball to Cubs second baseman Javier Baez, who threw to first baseman Anthony Rizzo, who stretched in an attempt to catch the ball and tag first base before Gillaspie's arrival. Initially ruled an out by 1B Umpire Marvin Hudson, Giants Manager Bruce Bochy elected to challenge the play, alleging that Rizzo's foot had come off the base prior to his catch of Baez's throw. - Mid Home (Press Box): This angle suggests the foot was pulled first, but is not entirely convincing. - Low Home: This angle, from the backstop behind home plate, is similarly inconclusive. - Mid 1B INF: This angle, from the mid stands on the first base infield side, simply is stacked/unclear. - Center Field (CF) [Pictured, Above]: As depicted above, this angle was not conclusive either way. - Low First [Pictured]: This angle, from the outfield-side dugout camera well, suggests Rizzo's foot broke contact with first base, but fails to indicate whether the ball had been caught by this time. - Mid 3B INF: This angle from the opposite infield has the catch, but is inconclusive regarding the foot. - High RF Foul [Pictured]: The RF look suggests the foot was off the base when the ball was caught. Perhaps this High RF Foul look is conclusive. The best angle for this play was the High RF Foul camera because it, unlike the others, provides daylight or a keyhole look between base and foot while still offering similar contrast between ball and glove. Unfortunately, Rizzo's catch occurred between frames during the 6th inning play such that it might have not been clear enough for New York. 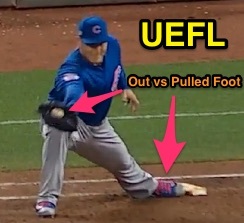 Thus, it appears the call was missed as Rizzo did pull his foot prior to catching the throw, but without any one individual angle to, on its own, conclusively demonstrate both parts of the play (the catch and the pulled foot), this call was ruled "inconclusive" for the Replay Official ruled the evidence obtained was not sufficient for him to "definitively conclude that the call on the field was incorrect." The Replay Review regulations do not provide for "combining" or synching replay angles, split screens, or digital zoom, but do not prohibit it. In other words, the point is officially unaddressed. - High RF Foul: This angle better demonstrates a pulled foot prior to a catch of the throw. Once again, viewing multiple angles simultaneously might have helped lead the Replay Official to "definitively conclude that the call on the field was incorrect" (especially for the 6th inning play). Or maybe it would have led this person to conclude the call was correct. As is, the official word for both reviews was, "call stands."